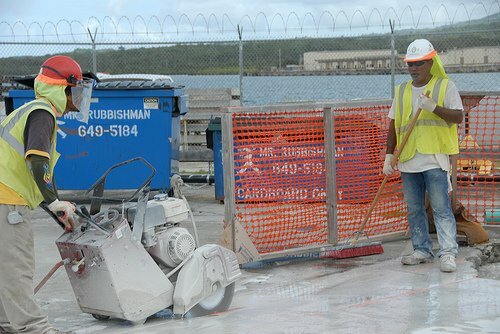 Service Costs > How Much Does Saw Cutting Concrete Cost? How Much Does Saw Cutting Concrete Cost? Saw cutting concrete is the process of using a saw to create a clean, straight cut through concrete in order to remove a portion of a wall, sidewalk, road, or driveway. Even though it’s called concrete cutting, it’s actually a grinding process. The diamond blades, often used while cutting, create an abrasive surface, which, as being used, grinds away at the concrete at high speeds. How much does concrete saw cutting cost? The costs of saw cutting a concrete slab are solely dependent on the size of the slab surface and the condition/location of the wall. Oftentimes, concrete cutting involves more than one activity, which means that the different activities that need to be performed will demand varying charges. The charges for saw cutting concrete are usually dependent on the depth per linear foot. The outdoor cost, 1 to 1.5 inches in depth, can be about $0.60 per linear foot, while indoor cutting costs can around $1.50 per linear foot. However, the outdoor costs, with a depth of 16 inches, will cost about $5 per linear foot, while the indoor price is around $8 per linear foot. The deeper the concrete is, as you can see, the more you are going to have to spend. The average block of concrete will be four inches; however, walls can range from six to as deep as 16 inches. Wall sawing, on the other hand, can cost anywhere from $10 to as much as $55 per linear foot, again, depending on the depth. All contractors, before they even start the job, will have a minimum service charge, often ranging from $50 to $150. With so many variables, consider using HomeAdvisor.com to receive multiple free quotes from licensed contractor sin your area for free. For example, AllCostData.info claims that saw cutting can cost anywhere from as little as $0.74 to as much as $8.31 per linear foot, and the costs will depend on the surface being cut and the depth of the concrete. Limited Access, Inc., according to its official pricing list, has a minimum charge of $150 and charges $4 per linear foot for 4-inch deep concrete slabs. According to this forum thread on DIYChatRoom.com, he was quoted $720 to cut a trench across 25 feet of his patio to reroute a drain line. There are three common types of concrete sawing methods: flat sawing, wall sawing or hand sawing. Flat sawing, which is also referred to as slab sawing, is the process of cutting the upper portion of concrete to create an even plane, up to 24 inches in depth, on average. This method can level out damaged pavement, help lay underground wires or provide control joints. Wall sawing, as the name notes, is designed for creating a precise cut in a vertical or horizontal concrete slab wall. This can include creating a door well, HVAC openings and/or a window opening, for example. These wall saws often use a low vibration to minimize damage when the concrete is being removed, and depending on the type of saw, most can cut up to 35 inches in depth. Lastly, hand sawing using a diamond blade to offer flexibility and options to create a cut in hard-to-reach areas or an area with limited access. Depending on the size of the job, concrete strength, and presence of reinforced steel, the average saw can cut up to 70 square inches per minute, meaning, if the concrete were five inches thick, the average contractor could cut up to 40 feet in an hour or 240 feet in one day. Concrete that has to be removed and hauled away after the job can cost around $15 to $30 per square foot. Contractors that have to travel outside of their normal radius can incur additional travel expenses. Hard-to-reach areas where their equipment can’t reach can increase the price. Complex areas filled with wiring and/or plumbing can incur additional charges.